Wasting time and getting frustrated trying to figure it all out yourself is one of my biggest pet peeves. Why should we spend hours or days when someone could show us in a few minutes? I don’t want that for myself and I don’t want it for you. That is why I am giving away my time absolutely free to get you the answers you want and need so you can soar instead of take a dive online. How better to find out if you will get your money’s worth in our new membership site than to get to try it out. Find out just how quickly I can solve your greatest challenges. I am live right now and will be for many hours. I will continue to be live off and on almost every day all day into the evening. Afternoons and evenings CST are the best time to reach me live. If there is anything about social media, blogging, marketing, branding that you really want to know here’s your chance. Look for the chat box at the bottom right corner. 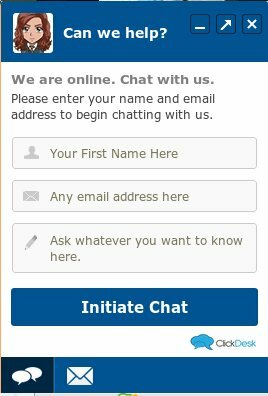 Live chat is one of the best ways to engage visitors to your site. For this very important project we are using ClickDesk. If you want powerful live chat with built in VOIP, support system, and web conferencing, check them out. Hi Gail…Thanks for sharing very good article about live chatting on Social Media. Very useful for me, And of course it will expand my knowledge about the development of Internet technology. Continue to provide knowledge to others . Really inspiring, I would like to add this feature on my website as soon as possible. Live chat is very interesting I will join you. Google plus is very good for generating traffic on website. However is it good for getting local traffic? It can be if you join or create a community that is based on location. That is true of all social networks. While they are usually internationally used, you can develop a local following. Thanks for sharing very good article about live chatting on Social Media. Damian Chmiel would love you to read ..Prawo do bycia zapomnianym przez wyszukiwarkę? Hey Gail thanks for the post. I am struggling to get targeted traffic to my landing page please advice. Simon Chow would love you to read ..How one email created $3896.36 recurring commissions? There are a ton of ways to get traffic from commenting to social media, bookmarking, and many others. You could join our blogger mastermind to see the resources we’ve compiled. I’ve put that link in this comment for you. Hey Gail thanks for reply. I would like to check with you is it possible to chat with you on Skype. Please provide your Skype id. Hey Gail sorry man I found the Skype id and send you send request, please accept. Let me know if you have any questions. I often already have content published here or elsewhere with comprehensive answers. I see you’re in Pakistan. I write for the owner of http://pakwired.com who also owns the site where our new Social Implications Cooperate (SMsimpl) membership site is. I’m inviting everyone to join there where they can get advice on social media strategy.